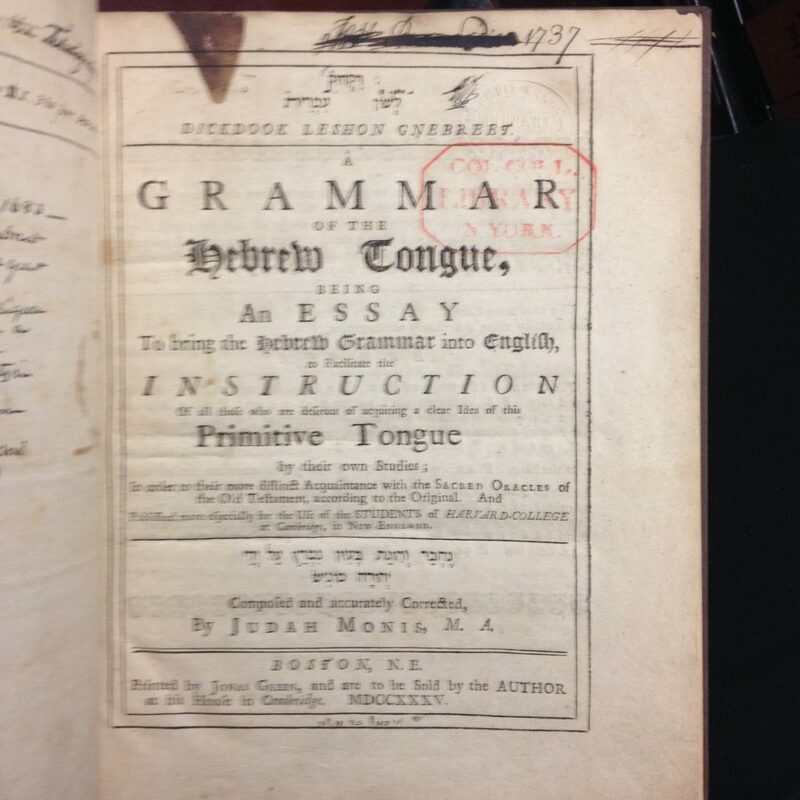 It isn’t surprising, given the strong history of Hebrew at Columbia since its inception, that we have a copy of Judah Monis’s Grammar of the Hebrew Tongue, the first book to be printed using a significant amount of Hebrew type in the Americas. 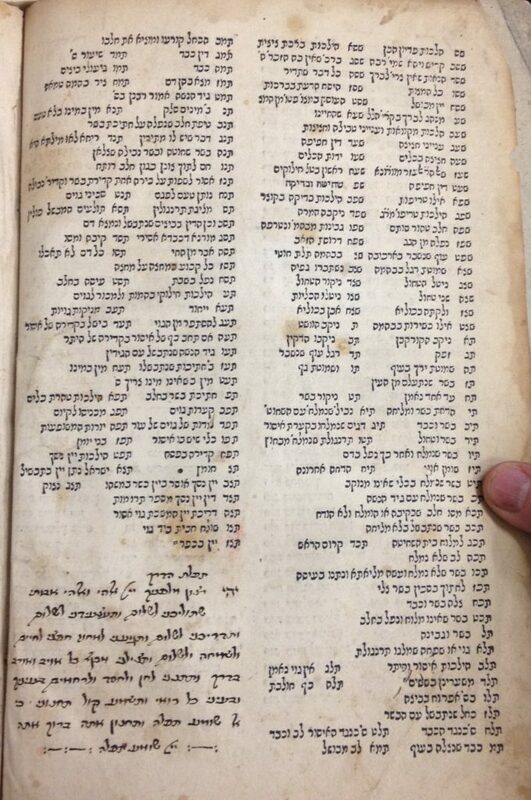 Due to lack of Hebrew type availability, Monis convinced Harvard to order the type specially from London (prior to this printing, students had to copy his textbook by hand for his class). 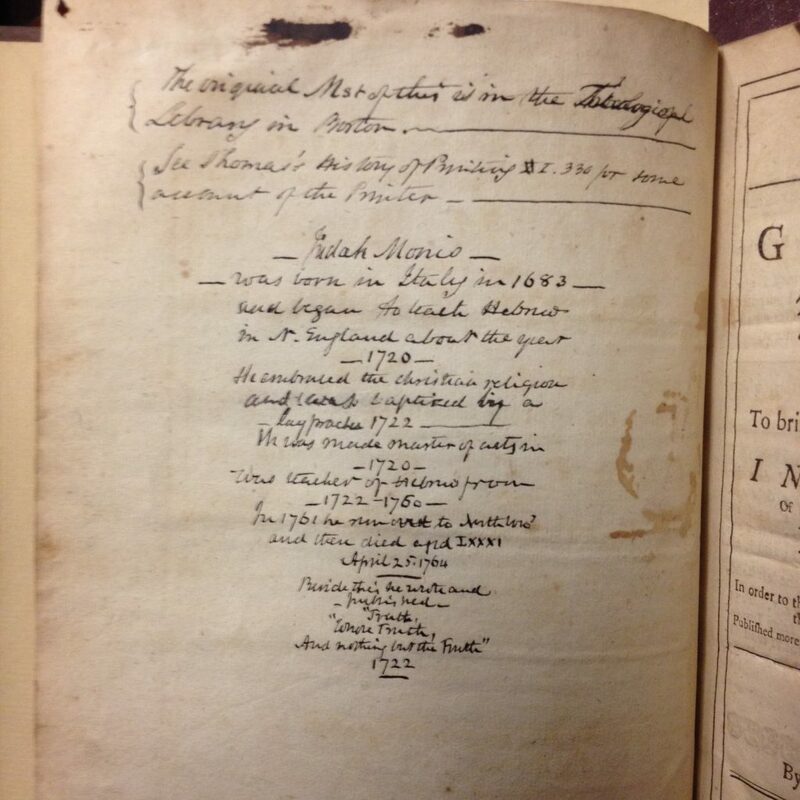 Columbia’s copy was owned by someone (perhaps one of Monis’s students) as early as 1737 (see photo above), and there is a description of Monis and his work on the flyleaf facing the title page of the book, as pictured on the right. Another book comes from a century earlier. 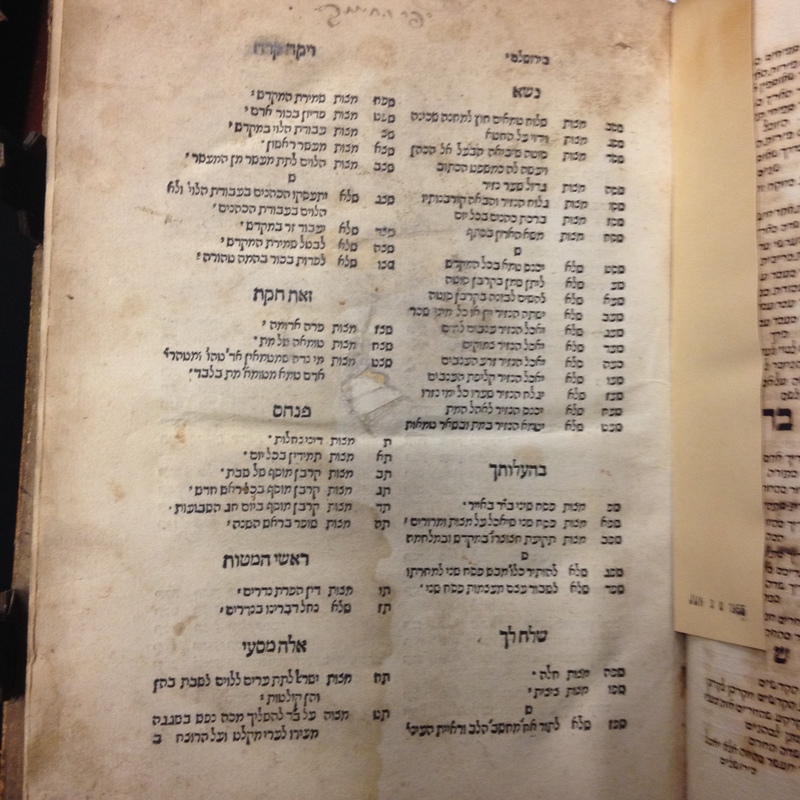 Printed in 1523 by the famed Venetian printer Daniel Bomberg, this Sefer Ha-hinukh was missing some pages. 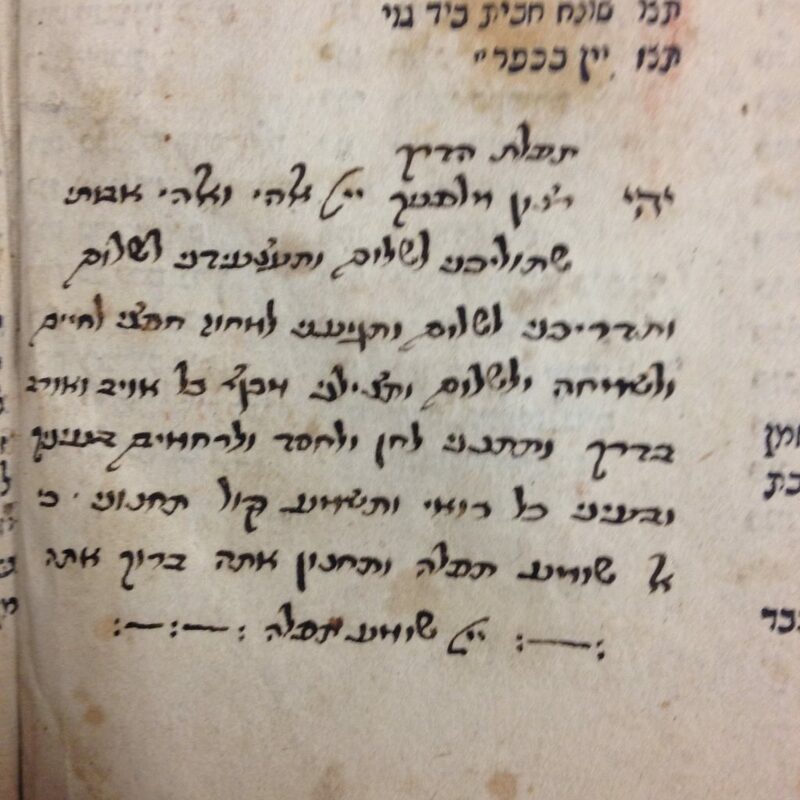 The book’s owner painstakingly copied the Hebrew type to fill in the missing leaves. Can you tell which was printed and which was handwritten? Jews traveled for many reasons: persecution, trade, marriage, to name just a few. 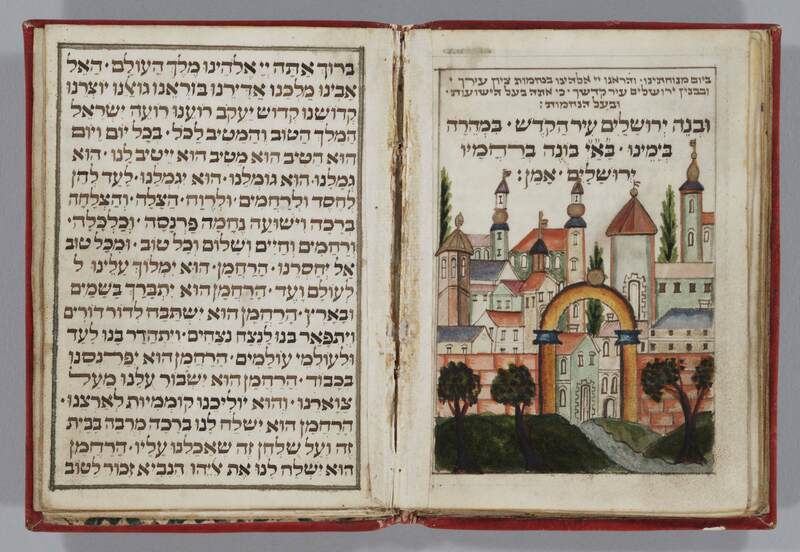 The owner of this Sefer ha-Rokeah (an ethical work, this one printed in 1505) apparently traveled often, but wanted to bring his book of ethics along on his journey. At the end of the front matter, right before the text begins, the owner wrote Tefilat Ha-derekh, the Wayfarer’s prayer, as shown below. The last item, a Hebrew Bible, was probably owned by a Christian interested in studying the text in its original language. 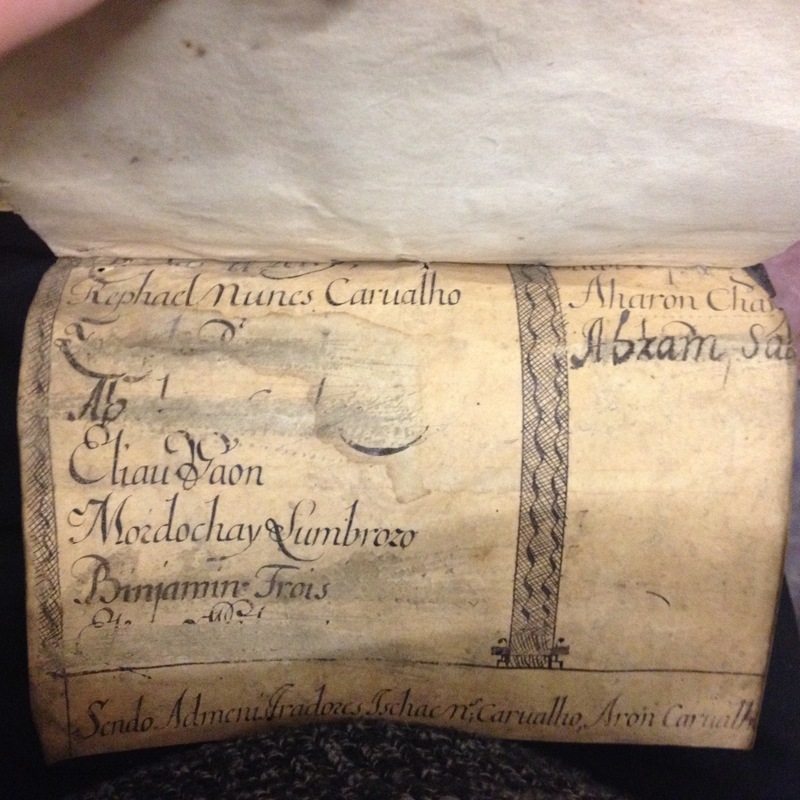 The owner had a special binding made for the book to allow for his study. Between each leaf of the original book, the binder inserted a much larger paper for comments and notes. This way, the owner could add his extensive glosses to the text without interfering with the original. The binding nearly doubled the size of the book, as shown here. 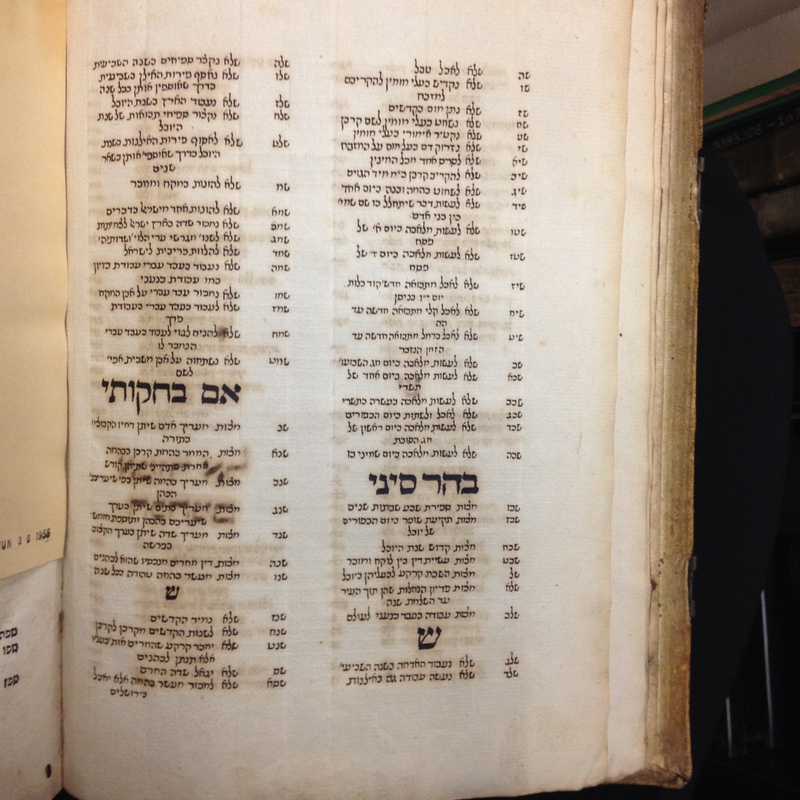 This entry was posted in Uncategorized and tagged American, Amsterdam, Hebrew_printing, kabbalah, Ladino, Rare_Books, RBML on March 24, 2017 by Michelle. From its inception in 1754, the founders of Columbia University felt that the study of Hebrew was critical to understanding the classics. 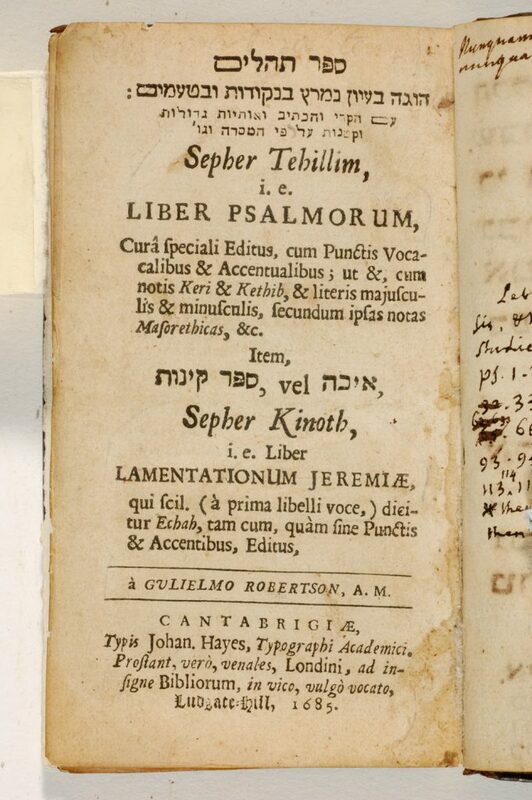 Columbia’s collection includes founder Samuel Johnson’s own copy of a Hebrew-Latin psalms with the Hebrew alphabet written in his own hand. Another professor in the 18th century was Johann Kunze, who taught Hebrew at Columbia from 1784-1787, and from 1792-1794. Professor Kunze was well-known for his Hebrew scholarship far beyond Columbia. He was also close with Gershom Seixas, a Columbia trustee (appointed 1784) and important Jewish figure of the colonial era. While Kunze was in New York (he had previously taught Hebrew at the University of Pennsylvania), he was also the pastor of the Trinity and Christ Church, the city’s only Lutheran house of worship. Kunze authored the first Lutheran hymnbook in English. When he was teaching Hebrew at Columbia College, the only Hebrew type to be found was at Cambridge, where another professor of Hebrew (at Harvard) had brought in from England so he could print his textbook. In New York, however, Hebrew type was not easily attainable. 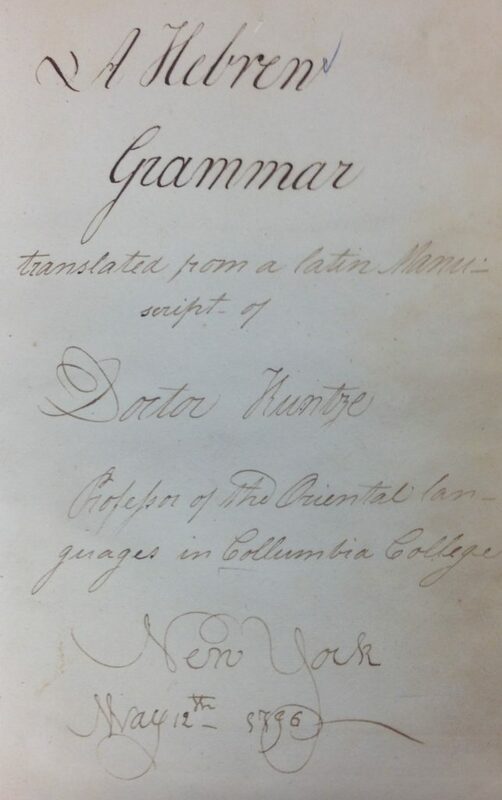 It seems that Professor Kunze handwrote a Hebrew grammar for his class (in Latin), from which a student copied (and translated) a copy for himself in May of 1796. 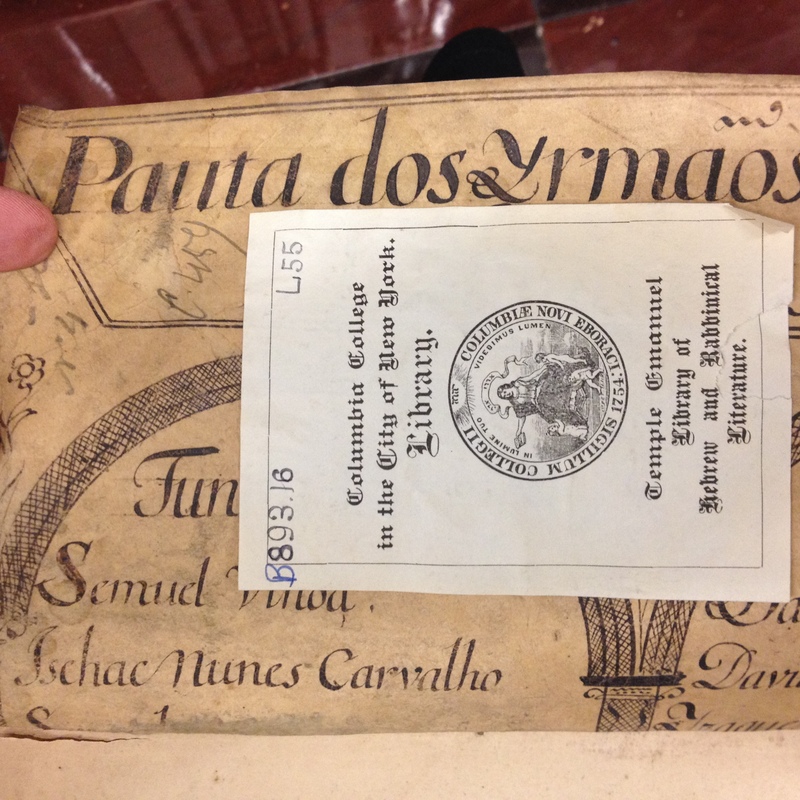 We are pleased to announce the acquisition of this manuscript to the Columbiana collection of the University. This new manuscript is item 209 in the Columbiana manuscripts collection. This entry was posted in Uncategorized and tagged American, Columbia History, Jewish-Christian relations, manuscripts, New Aquisitions, Primary Sources, RBML on October 5, 2016 by Michelle. Eight early American Jewish Newspapers, now available digitally! Columbia is very proud to have been involved, with New York University and the New York Public Library, in helping the American Jewish Press to be added to the Historical Jewish Press’s corpus. We look forward to continuing this collaboration in the years to come. Keep an eye on the Jewish Press in the USA section of the site, as there will be more newspapers added in the future! This entry was posted in Uncategorized and tagged American, digital, Full-text, Ladino, newspapers, Primary Sources, Yiddish on February 13, 2015 by Michelle. The Leeser site, developed as an international partnership over the course of seven years, is the first of a number of planned digital initiatives as part of the Jesselson-Kaplan American Genizah Project. 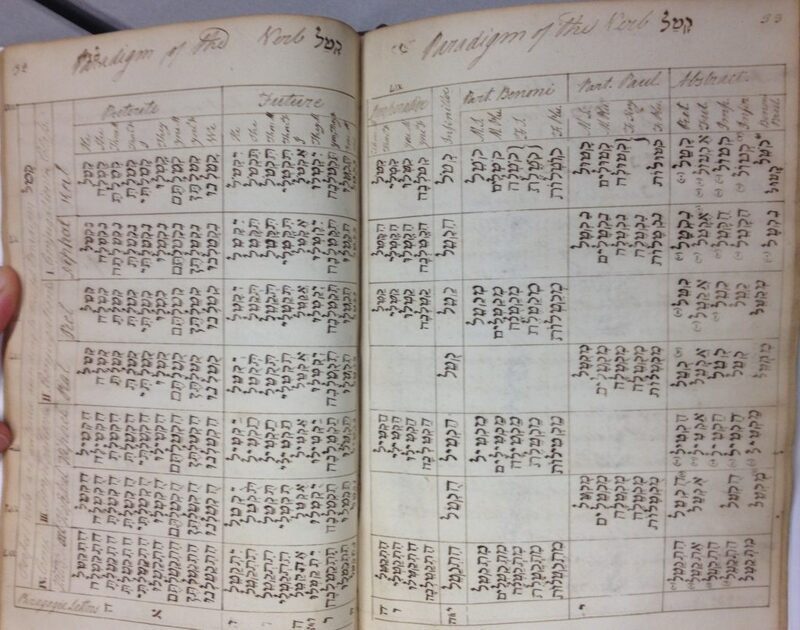 The Jesselson-Kaplan American Genizah Project, founded in 2006, is an international initiative to integrate digital technologies into the way we study early American Jewry. 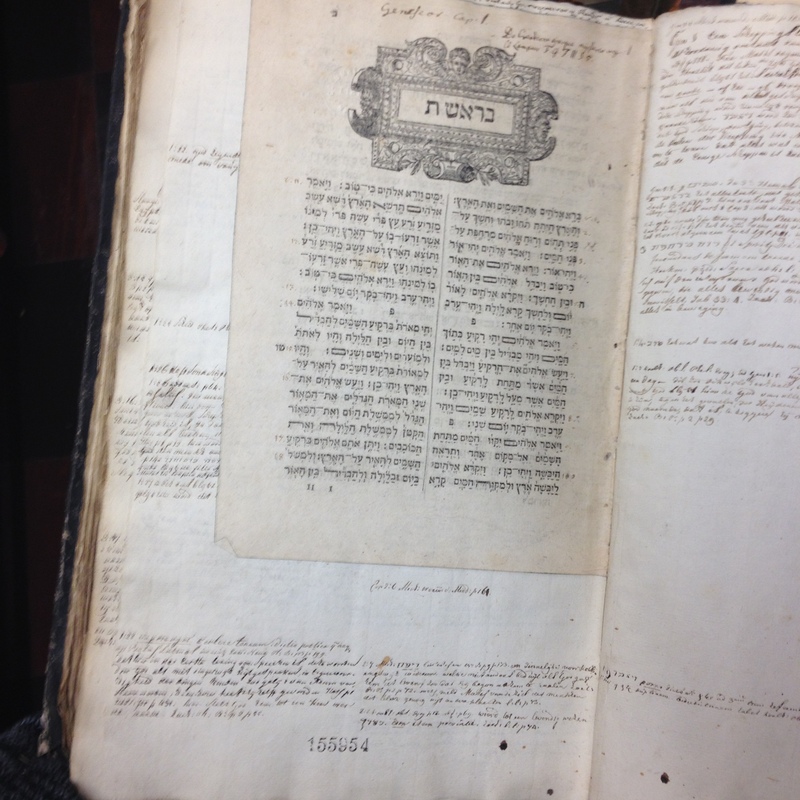 Its primary goal is to create an open access digital repository or “genizah” of physically dispersed primary sources that document the development of Jewish life in the western hemisphere from the 16th-19th centuries. This looks to be a wonderful new primary source resource in the history of the Jews in the Western Hemisphere. This entry was posted in Uncategorized and tagged American, digital, Full-text, Primary Sources on May 29, 2013 by Michelle. Synagogue records, as records of a particular community in a particular place, can contain tremendous gems for scholarship in Jewish history. Thanks to a wonderful collaboration between the The Library of the Jewish Theological Seminary and the American Jewish Historical Society, the records of five of the most important synagogues in New York City are being made available freely online via the Early New York Synagogue Archives portal. The portal contains records from the Sherith Israel, B'nai Jeshrun, Ansche Chesed, Kane Street, and Eldridge Street Synagogues and date from the 1730s through the 20th century. This entry was posted in Uncategorized and tagged AJHS, American, JTS, New York, Primary Sources, Synagogues on February 28, 2013 by Michelle. The Central Archives, located in Jerusalem, is a tremendous resource for the history of the Jews all over the world. In the past, however, it was sometimes hard to find what the collection held, as the collections are so vast and deep. Recently, the Central Archives has put together some wonderful new finding aids (by creator organization, by Jewish community location, and by donor) which should make the search for Jewish community records much easier. See below for an important list of recently processed (and soon-to-be processed) collections. 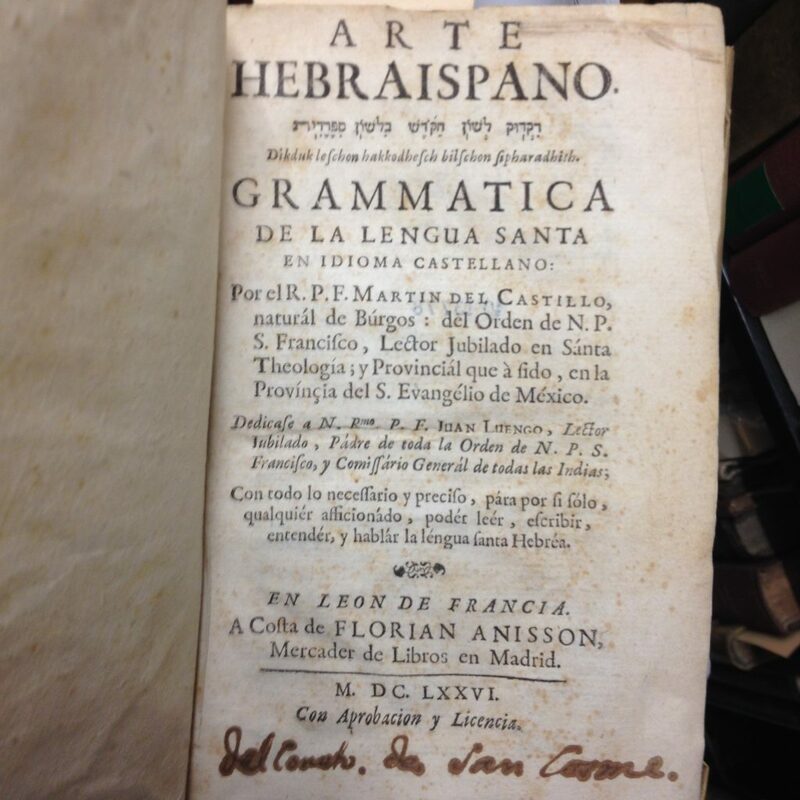 This entry was posted in Primary Sources and tagged American, Archives, Eastern_Europe, finding_aids, Latin_America, manuscripts, Primary Sources on January 15, 2013 by Michelle. To mark the beginning of a unique digital collaboration, the Digital Public Library of America (DPLA) and Europeana are pleased to announce the launch of Leaving Europe: A new life in America. The all-new virtual exhibition tells the story of European emigration to the United States during the 19th and 20th centuries. 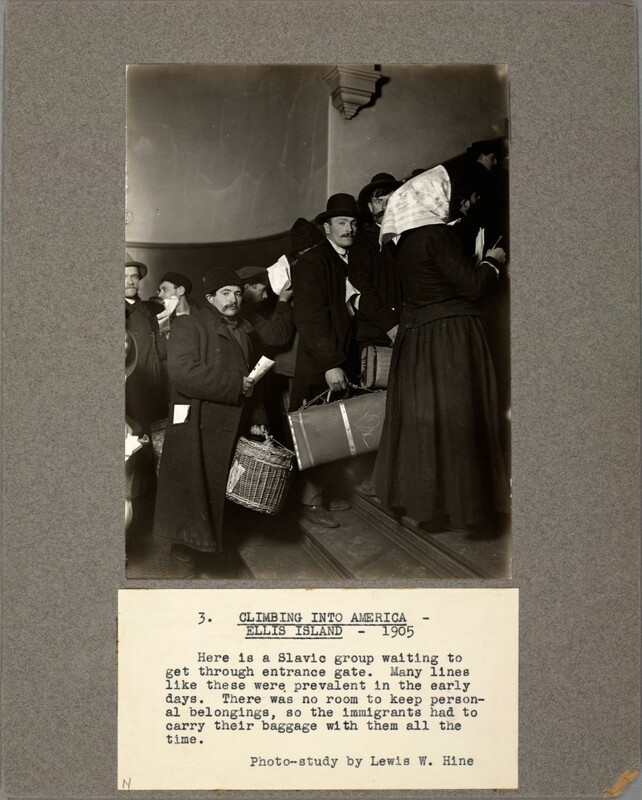 Jointly curated by the two digital libraries, the exhibition uses photographs, manuscripts, broadsheets, paintings, letters, audio, government documents and other unique materials to chart people's journeys across the European continent and their settlement in the United States. The digital items displayed are from U.S. and European libraries, museums and archives and the accompanying narrative has been commissioned specially for the exhibition from U.S. and European experts. The DPLA and Europeana—guided by a common mission to make the riches of libraries, museums, and archives openly available to everyone in the world—collaborated regularly with curators, content partners, project staff, and others to design and build the exhibition cooperatively. Leaving Europe: A new life in America represents the starting point of a significant long-term relationship between the two digital libraries. Over 30 million Europeans, from as far north as Scandinavia and as far south as Sicily, set sail to America in the 19th century and the first quarter of the 20th century. The exhibition, organized across seven major themes, describes the experiences that different groups of hopeful immigrants from across Europe faced. The exhibition allows the virtual visitor to accompany them on their often difficult journey from their native region and country, across the Atlantic and into the ports, cities and local communities of the United States. Leaving Europe: A new life in America is presented in French and English and features over 100 rare digitized items, many of which have not been made available before. Europeana's contributing partners to the exhibition include the Bibliothèque nationale de France, the National Gallery of Ireland, the Jewish Museum of London, the Royal Library of the Netherlands, the Saxon State Library and the Norwegian Photo Archives. The DPLA's contributors include the New York Public Library, Harvard University, The (U.S.) National Archives and Records Administration, and the University of Minnesota Immigration History Research Center. This entry was posted in Uncategorized and tagged American, immigration, Primary Sources on December 25, 2012 by Michelle. On November 8, at 6 PM, Liana Finck will be discussing and showing her graphic artistry based on the letters to the editor from the Jewish Daily Forward's Bintl Brief. A poignant collection of stories from the early 20th century, the Bintl Brief was the "letters to the editor" that highlighted the immigrant Jewish experience in America. 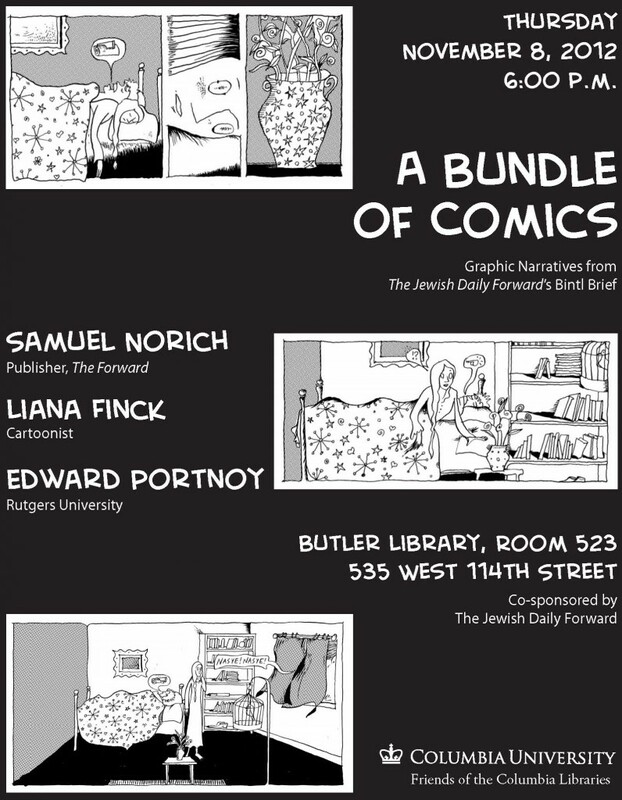 Also speaking will be Samuel Norich, the publisher of the Forward, and Rutgers University Professor Edward Portnoy, an expert on Yiddish popular culture. The lecture is co-sponsored by the Rare Book and Manuscript Library and the Jewish Daily Forward. This entry was posted in Uncategorized and tagged American, lectures, Yiddish on November 5, 2012 by Michelle. 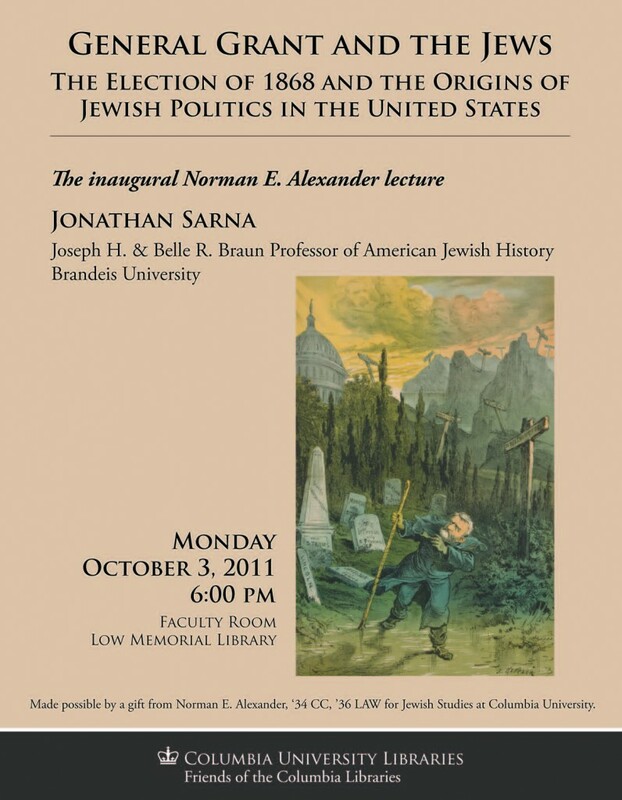 Please join us for the very first Norman E. Alexander Lecture in Jewish Studies on October 3. 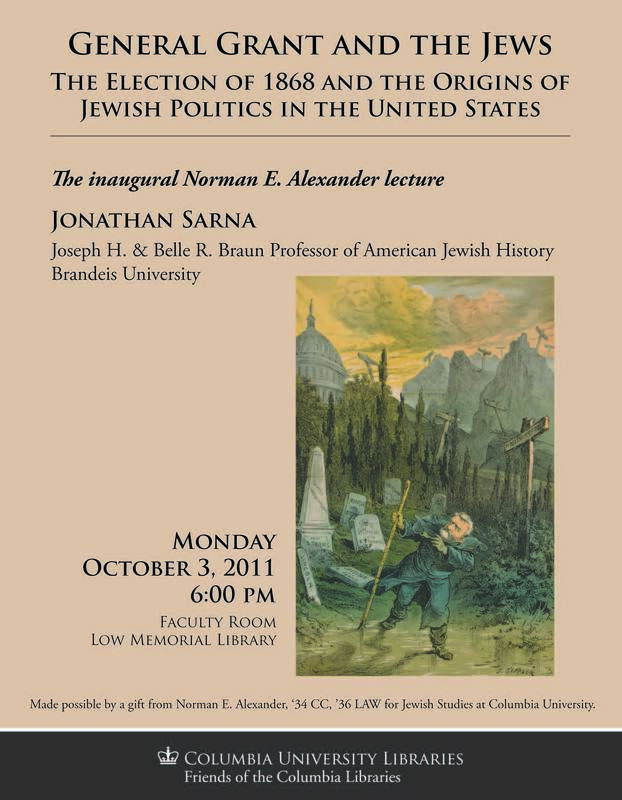 Jonathan Sarna was named the "Official Historian" of the 350th Anniversary of Jews in America, and we are very excited to be hosting him at Columbia. 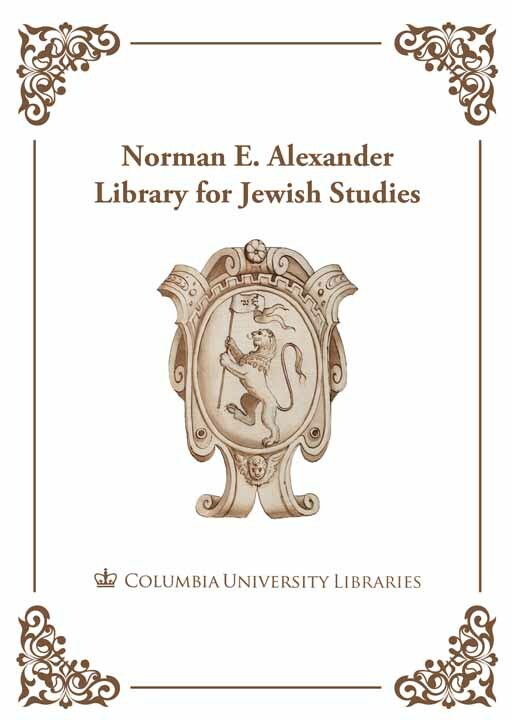 We are very grateful for the generous gift of the Norman E. Alexander foundation, which established the Norman E. Alexander Library of Jewish Studies, and will be supporting this event. This entry was posted in Uncategorized and tagged American, lectures, Norman_E_Alexander, Rare_Books, Sarna_Jonathan on August 29, 2011 by Michelle.